Review at In These Times! Thanks, Shaun Richman, for the lovely review at my old workplace (CWA represent). In These Times was where I worked out a lot of the ideas in this book, so excellent to see it reviewed there. They’ll also be co-sponsoring my Chicago appearance next month–stay tuned for details, it’s gonna be so good. Something is happening. Socialism is no longer a dirty word (the “S-word”), but something a sizeable portion of Americans tell pollsters is their preferred vision for society. It’s no longer an anachronism to speak of “the Left.” A brave and quickly organized movement for black lives has not only sparked a new civil rights movement but has gotten many of us to see the criminal justice system for what it is: the evolution of Jim Crow. Oh, and a hell of a lot more workers are striking than before. There have been attempts to describe this emerging movement for social justice in book form before. 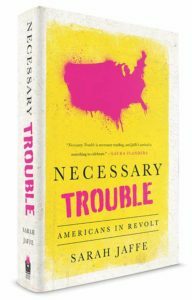 The latest, Necessary Trouble: Americans in Revolt by Sarah Jaffe, is the best so far. The Nation Books publication was released Tuesday. Jaffe, a freelance writer whose work has appeared everywhere from In These Times to The Guardian and The Atlantic, is a leading light in the new generation of labor and social justice reporters. The Washington Post reviews Necessary Trouble!